current accounts balance in Nigeria with emphasis on oil-related variables. This paper examines the determinants of current accounts balance in Nigeria with emphasis on oil-related variables, using the Johansen-Julius VAR co-integration estimation, the impulse response function and the variance decomposition analysis. The results show that oil price, oil balance and oil revenue are positively related with the current account, with only oil wealth having a significant negative impact in the long-run. We find that the impact of oil price on the current balance is only significant in the short-run. The variance decomposition analysis indicates that the variance in the current account is better explained by own shocks followed by shocks to oil price, oil balance and fiscal balance. 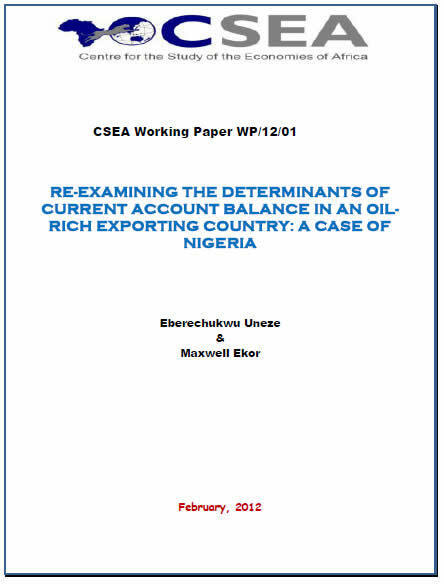 This report provides a concise and timely analytical overview of key aspects of the Nigerian economy. The report is an attempt to track the developments in the relevant aspects of the economy over a three-month period. It provides valuable insights into potential drivers of the economic trends and outlines expectations for subsequent quarters of the year. The areas of focus are Global Economic Performance, Domestic Economic Performance, External Sector Performance, and Sectoral Performance. Global crude prices settled lower in the review week (September 29 to October 6, 2017). Precisely, a barrel of Brent crude sold for about $56, showing a 6.3 percent decrease. Nigerias Bonny light exchanged at $56.76 per barrel as at October 6, 2017. The draw down in price may be attributable to indications of higher output, as revealed by the addition of more production rigs by the U.S, rise in Iraqs crude exports and survey showing OPECs overall boosted supply.